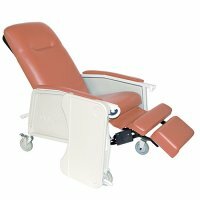 3 positions: upright, deep recline and elevated legrest/footrest. Retractable lock bar secures the chair in the desired position. Self adjusting suspension in the seat prevents bottoming out. 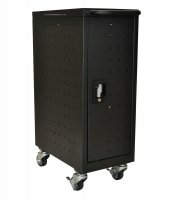 Side panels "pop-off" for easy cleaning and maintenance. 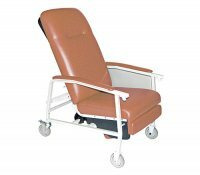 Large, blow molded tray locks in 5 positions and can be stored on the side of the chair. 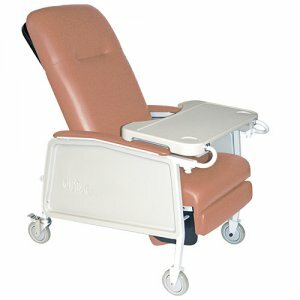 5" casters (2 with locks) make it easy to move and secure the recliner. 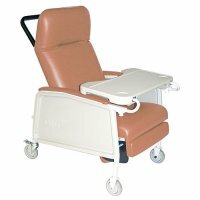 Height: 47.5"; Width: 32"; Depth: 41.5"; Width Between Arms: 24.5"; Floor to Arm (Height): 26.5"; Seat to Arm (Height): 9.5"; Seat (Height): 21"; Seat (Width): 25"; Seat (Depth): 20"